One empirical approach to the remote sensing of phytoplankton is to treat it as a special case of suspended solids and to use the increased reflectance in the near-infrared associated with the increased biomass. In the Landsat MSS red (600-700 nm) band, high concentrations of algae are associated with decreased radiance because of the chlorophyll absorption in this region. Strong (1974) observed in the case of Landsat pictures of an algal bloom on Utah Lake, USA, that there was a contrast reversal in going from the red to the infrared (700-800 nm or 800-1100 nm) bands: areas dark in the red image showed up as light against a darker background in the infrared images. Bukata et al. (1974) found that the reflected radiance in the Landsat 700 to 800 nm band correlated well with the logarithm of the chlorophyll concentration in Lake Ontario, Canada, and some nearby eutrophic water bodies. The sensitivity of this method is, however, comparatively low (>10mgchl am-3) and it is perhaps most applicable to highly productive inland waters that develop algal blooms. 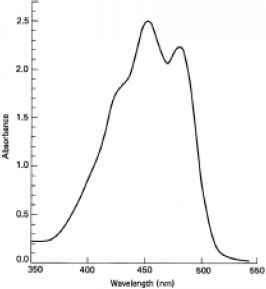 Reflectance spectra of algal cultures or eutrophic lake waters show, in addition to a dip at 670 to 680 nm, corresponding to the chl a absorption peak in the red, a peak in the 700 to 715 nm region.918,1181 As the phytoplankton concentration increases, the height of this near-infrared peak relative to reflectance at 670 to 680 nm increases, and the peak itself shifts from about 698nm to 712nm.455,1181 With increasing biomass, scattering, and hence reflectance, in the near-infrared must increase. The peak in reflectance at 700 to 715 nm corresponds to that narrow waveband of light which is not absorbed by the intensifying chl a band on the short-wavelength side or by the very steep rise in water absorption with wavelength on the other side. The water absorption remains constant, but as the chlorophyll band intensifies it removes increasing amounts of light from the short-wavelength side of the reflectance peak, thus pushing it further towards the infrared. Dekker et al. (1991), using a multispectral scanner (the Programmable Multispectral Imager) from an aircraft at 1000 m over eutrophic lakes in the Netherlands, found a good linear negative correlation between phyto-plankton chlorophyll and the ratio of red (673-687 nm) to near-infrared (708-715 nm) radiance values. In an equivalent observation, Mittenzwey et al. (1992), using a shipboard spectroradiometer positioned just above the water surface, found for productive (3-350 mg chl a m-3) lakes and rivers around Berlin, a very clear-cut positive correlation (r2 = 0.98) between phytoplankton chlorophyll concentration and the ratio of a near-infrared (705 nm) to a red (670 nm) reflectance (R705/R670). This provided the basis for an algorithm expressing chlorophyll concentration as a function of this reflectance ratio. Gower et al. (2005) report that with the MERIS sensor, which has a band (704-714 nm) centred on 709 nm, this near-infrared peak could be detected from space, in an image of a coastal phytoplankton bloom, off Vancouver Island (Canada). They used top-of-atmosphere radiances, uncorrected for the atmospheric contribution, and computed the Maximum Chlorophyll Index, which is the radiance in Band 9 (709 nm) above a baseline formed by linear interpolation between the radiances in Bands 8 (681 nm) and 10 (753 nm). Gower et al. suggest that the MERIS 709 nm band provides an important tool for the detection of intense algal blooms, phenomena of great significance - because they are so often toxic -for aquaculture. In a later study, Gower et al. (2008) report that with this technique they find an average of about one plankton bloom event somewhere in the world on any given day. The reflectance of water bodies in the green waveband also increases with phytoplankton concentration (see next section). Lathrop and Lillesand (1986), using Thematic Mapper data for Lake Michigan, found good linear relationships between the logarithm of chlorophyll concentration and the logarithm of radiance in the green band (520-600 nm), for the central lake (oligotrophic) and Green Bay (eutrophic). The relationships were, however, very different for the two parts of the lake, the central lake showing a much higher green radiance for a given level of phytoplankton than the bay, possibly due to a higher level of yellow humic substances in the latter water body, leading to greater absorption of green light. Clearly there is no prospect for a universal phytoplankton algorithm based on green reflectance, but locally applicable algorithms of this type may be of some use. A special case of increased reflectance associated with increased phyto-plankton concentration is that of coccolithophore blooms. These algae, despite their chloroplast pigments are very highly reflective because of the disc-shaped calcium carbonate coccoliths that cover the cells (Fig. 4.10), and which also become detached to float freely in very large numbers in the water. These show up as large milky-white patches in the ocean. They develop annually in the North Sea578 and can occur anywhere in the world's oceans. In every case examined so far the species responsible has been Emiliania huxleyi. Brown and Podesta (1997) observed, in CZCS images, blooms of this species off the southeastern coast of South America in late spring and summer, which seasonally occupied an area as large as 550 000 km2. Floating macroalgae, such as Sargassum spp., or Enteromorpha prolifera (massive blooms of which in the Yellow Sea presented problems for the sailing events in the 2008 Olympic Games) have a reflectance peak at ^860 nm in the near-infrared. Hu (2009) has developed an algorithm - the Floating Algae Index (FAI) - for use with the MODIS instrument on the Terra and Aqua satellites, which is defined as the difference between reflectance at 859 nm, and a linear baseline between the red band (645 nm) and the short-wave infrared band (1240 or 1640 nm). This has been found to work well for the detection of floating algae in a number of locations around the world's oceans.